Note: Private Cloud version 4.17.09 and earlier do not let you create keystores and truststore in the Edge UI. To create keystores and truststores for a Private Cloud deployment of Edge version 4.17.09 and earlier, see Create keystores and truststores for the Private Cloud 4.17.09 and earlier. To configure functionality that relies on public key infrastructure, such as TLS, you need to create keystores and truststores that contain the necessary keys and digital certificates. In Edge, keystores and truststores are both represented by a keystore entity that contain one or more aliases. That is, there is no implementation difference between a keystore and a truststore on Edge. keystore - a keystore entity that contains one or more aliases, where each alias contains a cert/key pair. truststore - a keystore entity that contains one or more aliases, where each alias contains a cert only. In this example, you specify the name of the keystore and alias used by the virtual host for its TLS keystore. You use a reference to specify the keystore name so that you can change it later when the cert expires. The alias contains a cert/key pair used to identify the virtual host to an TLS client accessing the virtual host. In this example, there is no truststore required. In this example, the <TrustStore> tag references a keystore only, it does not specify a specific alias. Each alias in the keystore contains a cert, or a cert chain, that is used as part of the TLS handshaking process. For all Cloud free trial organizations, Apigee creates a default keystore and alias. You should see a keystore named freetrial that contains an alias named freetrial. This alias contains the default certificate that Apigee provides for free trial accounts. Free trial organizations can use this default keystore and alias to test APIs, and even push APIs to production. Free trial organizations cannot use their own certs. They have to use the default keystore and Apigee-supplied cert. You can only upload your own certs after transitioning to a paid account. TLS certificate as a PEM or PKCS12/PFX file - either a certificate signed by a certificate authority (CA), a file containing a chain of certificates where the last certificate is signed by a CA, or a self-signed cert. Private key as a PEM or PKCS12/PFX file. Edge supports key sizes up to 2048 bits. A passphrase is optional. Edge provides a UI and API that you use to create keystores, create aliases, upload cert/key pairs, and update certs. The UI and API that you use to create a truststore are the same as you use to create a keystore. The difference is that when you create a truststore, you create aliases that contain only a cert. You can represent certs and keys as PEM files or as PKCS12/PFX files. PEM files comply with the X.509 format. If your cert or private key is not defined by a PEM file, you can convert it to a PEM file by using utilities such as openssl. Keystore If a cert is part of a chain, then you must create a single file containing all the certs in the chain. The certs have to be in order and the last cert must be a root certificate or an intermediate cert signed by a root certificate. Truststore If a cert is part of a chain, then you must either create a single file containing all the certs and upload that file to an alias, or upload all certs in the chain separately to the truststore using a different alias for each cert. If you upload them as a single cert, the certs have to be in order and the last cert must be a root certificate or an intermediate cert signed by a root certificate. If you create a single file that contains multiple certs, you must insert an empty line between each cert. When working with cert chains in a truststore, you do not always have to upload all the certs in the chain. For example, you upload a client certificate, client_cert_1, and the client certificate issuer's certificate, ca_cert. Alternatively, you have a second cert, client_cert_2, signed by the same cert, ca_cert. However, you do not upload client_cert_2 to the truststore. The truststore still contains only client_cert_1 and ca_cert. You can see all information about the alias, including the expiration date. Download the cert as a PEM file. Generate a CSR. If you have an expired cert and want to renew it, you can download a Certificate Signing Request (CSR). You then send the CSR to your CA to obtain a new cert. Create a new keystore or truststore. Add the new cert to the new keystore or truststore. Update the reference in the virtual host or target server/target endpoint to the keystore or truststore. See Update a TLS certificate for the Cloud for more. Delete the alias. Note: If you delete an alias, and it is currently being used by a virtual host or target endpoint, then the virtual host or target endpoint will fail. You can create a keystore for use as either an TLS keystore or an TLS truststore. A keystore is specific to an environment in your organization, for example the test or prod environment. Therefore, if you want to test the keystore in a test environment before deploying it to your production environment, you must create it in both environments. To create a keystore in an environment, you only need to specify the keystore name. After you create a named keystore in an environment, you can then create aliases and upload a cert/key pair (keystore) or upload a cert only (truststore) to the alias. Select the + Keystore button. Specify the keystore name. The name can only contain alphanumeric characters. Click Add. The new keystore appears in the UI. For the desired keystore, select the + button to add an alias. Select Certificate Only for Certificate Type. Select the Choose File button. A pop-up window opens to let you select the PEM file containing the cert. By default, the API checks to make sure the certificate hasn't expired. Optionally select Allow Expired Certificate to skip validation. Select Save to upload the cert and create the alias. Select JAR file for Certificate Type. Select the Choose File button next to Key File. A pop-up window opens to let you select the JAR file containing the cert and key. If the key has a password, specify the Password. if the key has no password, leave this field blank. Select Save to upload the key and cert and create the alias. Select Key and Certificate for Certificate Type. Select the Choose File button next to Key File. A pop-up window opens to let you select the PEM file containing the key. If the key has a password, specify the Key Password. if the key has no password, leave this field blank. Select the Choose File button next to Certificate File. A pop-up window opens to let you select the PEM file containing the cert. Select PKCS12/PFX for Certificate Type. Select the Choose File button. A pop-up window opens to let you select the file containing the key and cert. If the key has a password, specify the Password for the PKCS12/PFX file. if the key has no password, leave this field blank. Select Save to upload the file and create the alias. To create an alias that uses a self-signed certificate, you fill in a form with the necessary information required to create the cert. Edge then creates the cert and a private key pair and uploads them to the alias. Select Self-Signed Certificate for Certificate Type. Fill in the form by using the table below. Select Save to create the cert and private key pair and to upload them to the alias. The entity that signed and issued the certificate. For a self-signed certificate, this is the CN you specified when you created the cert. The certificate validity period represented as two dates: the date on which the certificate validity period begins and the date on which the certificate validity period ends. Both can be encoded as UTCTime or GeneralizedTime values. Common Name Common Name (CN) of the organization identifies the fully qualified domain name(s) associated with the certificate. It is typically composed by a host and a domain name. For example, api.enterprise.apigee.com, www.apigee.com, etc. Max length is 64 characters. Depending on the certificate type, the CN can be one or more hostnames belonging to the same domain (e.g. example.com, www.example.com), a wildcard name (e.g. *.example.com) or a list of domains. Do not include any protocol (http:// or https://), port number, or resource path. The certificate is valid only if the request hostname matches at least one of the certificate common names. Alternate Names List of alternative host names. Allows additional identities to be bound to the subject of the certificate. Defined options include an Internet electronic mail address, a DNS name, an IP address, and a uniform resource identifier (URI). Max of 255 characters for each value. You can separate names by comma, or by pressing the Enter key after each name. You can test your truststore and keystore in the Edge UI to verify that they are configured properly. The Test Ui validates a TLS request from Edge to a backend service. The backend service can be configured to support one-way or two-way TLS. Enter the hostname of the backend service. Enter the TLS port number (typically 443). Optionally specify any Protocols or Ciphers. For the desired truststore, select the Test button. 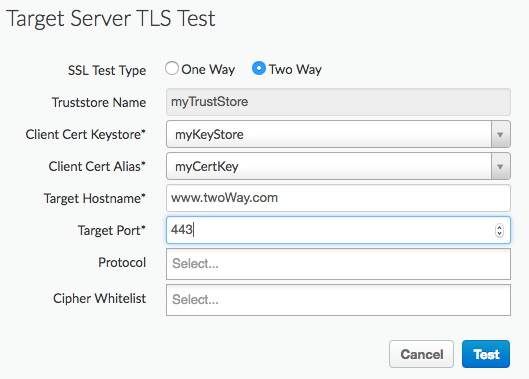 Specify the name of the keystore used in two-way TLS. Specify the alias name in the keystore containing the cert and key. For inbound connections, meaning an API request into Edge, update the virtual host configuration to reference the new keystore and key alias. You can delete a keystore or truststore by selecting the "X" icon to the right of the name on the TLS Keystore tab. If you delete a keystore or truststore that is being used by a virtual host or target endpoint/target server, all API calls through the virtual host or target endpoint/target server will fail. Caution: You should not delete a keystore until you have converted your virtual hosts and target endpoints/target servers to use a new keystore. You can delete an alias by selecting the "X" icon to the right of the alias name on the TLS Keystore tab. If you delete an alias that is being used by a virtual host or target endpoint/target server, all API calls through the virtual host or target endpoint/target server will fail. Caution: You should not delete an alias until you have converted your virtual hosts and target endpoints/target servers to use a new keystore and alias.